The theme for the second Responsible Fashion Summit held was ‘Earth Sensitive’, with nearly every stakeholder of the fashion supply chain sharing knowledge of direction. It commenced with three key international designers, David Abraham, Sharleen Ernster and Heidi Gosman, who shared important perspectives, including disposal of the garments being considered, as part of the design thought process, which is something that has not been strongly followed by designers, resulting in landfill issues. Responsible Fashion Summit is part of The Responsible Fashion Movement that focuses on responsibility, accountability and transparency. It has defined eight impact areas as the basis of solutions to issues that the global fashion industry faces. The Responsible Fashion Movement has modelled itself on the most relevant aspect of solutions and longevity. Fashion currently ranks among the top three most polluting industries in the world is drawing attention and yet the action to reduce negative impact is still slow in gaining momentum. The sustainable fashion products continue to grow at a steady pace. It is led by an ever increasing population of aware and discerning consumers in US, Europe and parts of Asia which is beginning to put pressure on global fashion brands to open their doors to clean fashion. The manufacturers who will move in this direction earlier will have an advantage. There also exists a wide gap between the action of designers and manufacturers; hence so far every action is resting with the manufacturers. The designers are in a position to lead the corrective action. The Responsible Fashion Movement is endorsed by The Commonwealth Fashion Council (CFC), London. Daniel Hatton, Director and CEO of the CFC is in Colombo to speak at the forum. 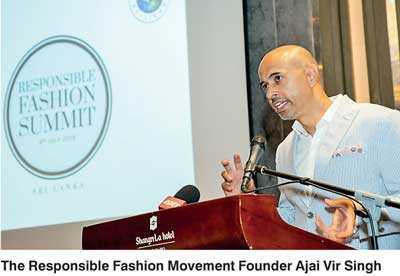 Responsible Fashion Summit is presented by MAS Holdings, hosted at Shangri-La Hotel, Colombo, in association with Hirdaramani Group, Beira Group, BMW i3 and The Design Development Corporation. For registrations mail connect@responsiblefashion.org. For more information please visit the official website responsiblefashion.org. Stay informed of the latest on the Responsible Fashion Movement by using #responsiblefashionmovement and #responsiblefashionsummit on Facebook (www.facebook.com/responsiblefashionmovement/) and Instagram (@responsiblefashionmovement) for the latest updates, photos, videos and more.